Sorry, I dozed off for a second. It’s sorta become habit after reading Inferno. BORING! Honestly, I could end the review there and be fine with it, but I suppose I should give you a little more feedback. *Sigh…Okay, it’s not that I hated Inferno (that would imply I felt something about it, which I really didn’t.) The most I felt was disappointment. I thoroughly enjoyed Dan Brown’s earlier novels, up until Lost Symbol. That’s when it appears he lost his magical touch. Now, I can’t say Inferno was QUITE as bad as Lost Symbol, but it was close. And I think it was because Dan Brown fluffed the entire thing up with descriptives. Every painting, every building, every statue, every floor, every ceiling, every nook, every cranny…everything had to be broken down into finite detail. I don’t know how many times Robert Langdon would be running for his life and he would glance over to admire the turrets of Del Historical Building. I literally began skimming pages, knowing they had no real consequence on the actual story. Another thing that’s starting to bother me about Dan Brown’s books is Robert Langdon’s sheer dumb luck and gee-golly! coincidences. A shadow hits an artifact at just the right angle and Langdon is magically struck by an epiphany! “Look at this,” he whispers in amazement. “The shape of the shadow on this rare coin reminds me of this unheard of painting that will help lead us to our next clue!” (or whatever). I will say the general premise of Inferno was intriguing, but all of the twists at the end were not unexpected. In fact, I predicted at least half of them and wasn’t shocked by the rest. Here’s to hoping Lost Symbol and Inferno were unfortunate misfires, and Dan Brown’s next book will deliver the same edge of your seat, hold your breath moments that his earlier novels did. For a full synopsis, click here. 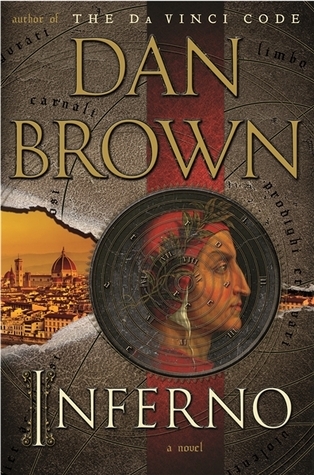 Posted on September 11, 2013 October 16, 2013 by jenspendenPosted in Jen's Shelf, UncategorizedTagged book, book review, books, Dan Brown, fiction, Inferno, literature, Lost Symbol, reading, review, Robert Langdon. I’ll have to agree with you, Inferno failed to impress unlike “Angels & Demons” and “The Da Vinci Code” which were really captivating reads. I wonder whether Dan Brown has any plans for a sequel. It makes me wonder what else Robert Langdon can do, aside from solving puzzles and saving the world. He’s already too popular.